Side view of Triceratops horridus skeleton cast, Senckenberg Museum. The Ceratopsia are the horned dinosaurs of the order Ornithischia. Triceratops is the best-known, and one of the largest. They are a group of herbivorous, beaked dinosaurs which thrived in what is now North America and Asia, during the Cretaceous period. Ancestral forms of this group lived earlier, in the Jurassic. Early members, such as Psittacosaurus, were small and bipedal. Later members, including Centrosaurus and Triceratops, became very large quadrupeds. They developed elaborate facial horns and a neck frill. The frill served mainly to protect the vulnerable neck from bipedal predators like Tyrannosaurus, who attacked from above. The frill was no doubt also used in display, thermoregulation, the attachment of large neck and chewing muscles or some combination of the above. 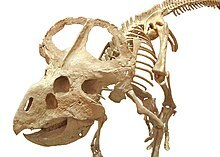 Ceratopsians ranged in size from 1 meter (3 ft) and 23 kilograms (50 lb) to over 9 meters (30 ft) and 5,400 kg (12,000 lb). Triceratops is by far the best-known ceratopsian to the general public. ↑ Dodson P. 1996. The horned dinosaurs. Princeton: Princeton University Press. This page was last changed on 21 November 2018, at 19:02.